1- Asia-Pacific excluding Japan (APEJ) is expected to remain dominant in the global canned motor pumps market, in terms of volume as well as revenues. The region is also expected to remain the fastest expanding market for canned motor pumps. 2- In terms of revenues, the markets in North America and Europe are projected to exhibit similar CAGRs through 2026. However, in terms of volume, the market in Europe will continue to exhibit a comparatively faster expansion than that in North America. 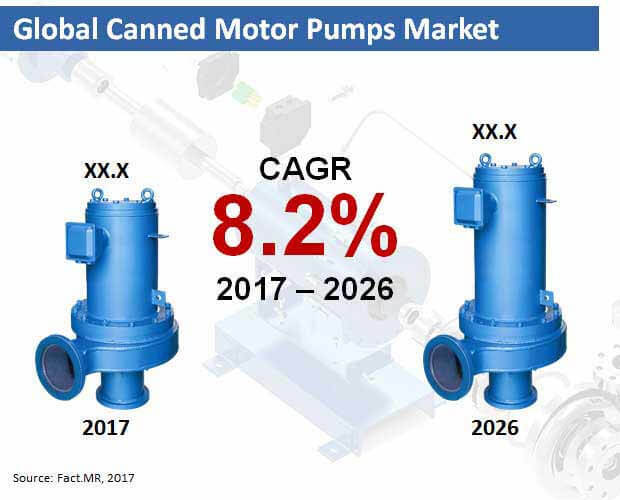 3- Revenues from sales of canned motor pumps in Latin America and Middle-East & Africa (MEA) will remain sluggish, and will increase at an approximately similar CAGR through 2026. 4- Volume sales of standard pumps and high temperature pumps will remain significantly higher than all the other product segments included in the report. However, revenues from these two product segments will remain relatively lower in the market. In addition, revenues from sales of reverse circulation pumps and multistage pumps will account for the largest market shares during the forecast period. Multistage pumps are anticipated to witness the lowest volume sales in the market during 2017 to 2026. 5- Canned motor pumps will find the largest volume sales for end-use in the chemical industry. Although volume sales of canned motor pumps for end-use in waste & wastewater and pharmaceutical industries will remain nearly similar, revenues from canned motor pump sales in the former will remain comparatively larger than those from the latter. In terms of both volume sales as well as revenues, canned motor pumps will continue to witness the lowest end-use in food & beverages industry. 6- On the basis of capacity, small capacity canned motor pumps will remain preferred in the market. Volume sales of small canned motor pumps will exceed 3,000 Mn units, to surpass revenues worth US$ 2,000 Mn by 2026-end. Volume sales of medium and high capacity canned motor pumps will collectively outgrow their small capacity counterparts by 2026-end. 7- Fact.MR’s report has profiled key active market participants, which include Honda Motor Co., Ltd., Champion Power Equipment, Inc., Generac Holdings Inc., Yamaha Motor Co., Ltd., Toshiba Corporation, Hyundai Motor Company, Briggs & Stratton Corporation, Wuxi Kipor Power Co. Ltd., Lifan Industry (Group) Co., Ltd., Ryobi Limited, and Subaru Corporation.